Have you ever been to a co-op? Me neither. But I hear they are pretty awesome. Here are some Utah co-op websites that I have heard about. You can also go to http://kaysville7rs.blogspot.com/ for more links, and penny pinching ideas. I do Bountiful Baskets every week and CrossRoad (foodco-op.net) every month. We love them! 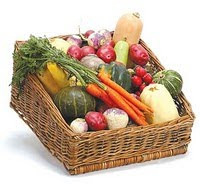 Bountiful Baskets is $16.50 and you get LOTS of produce! Crossroads is where we get our meat from - they use Utah farmers!